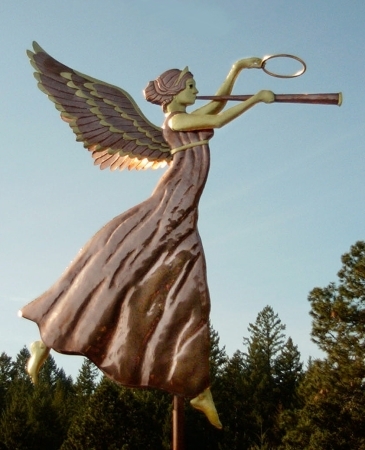 Our Triumphant Angel Weather Vane was inspired by a late 19th century, molded copper, weathervane based on the Angel Gabriel. 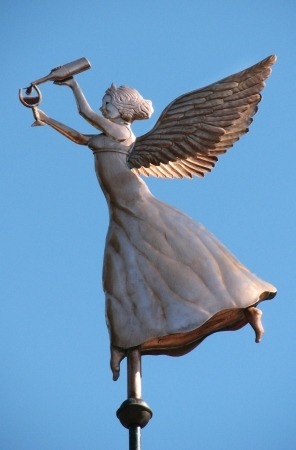 While we have reinterpreted it for a West Coast Weather Vane feel, it maintains a classic resemblance. She is a relatively new design and has a beautiful profile against the skyline. 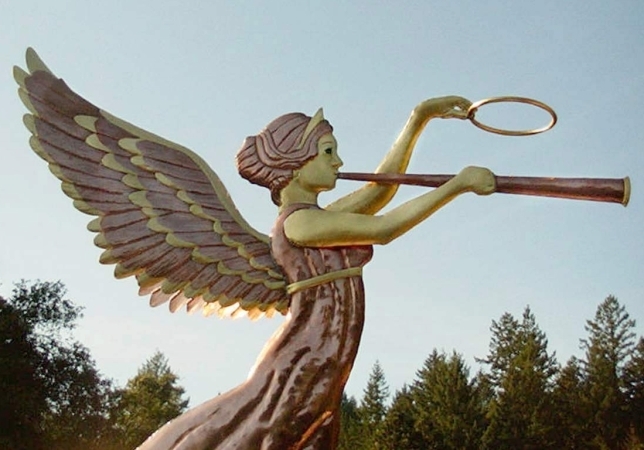 As depicted here, we added optional gold leaf to the angel’s face, arms, feet, wing tips and headdress. 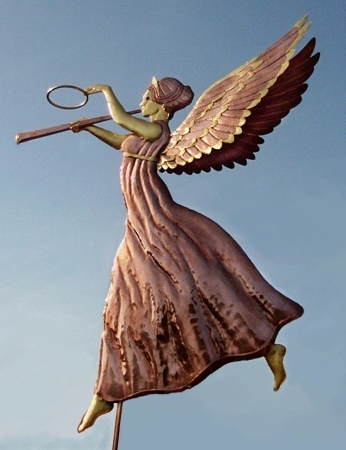 Other customers have requested optional gilding on the trumpet and halo. Copper itself will first weather a deep chocolate brown. 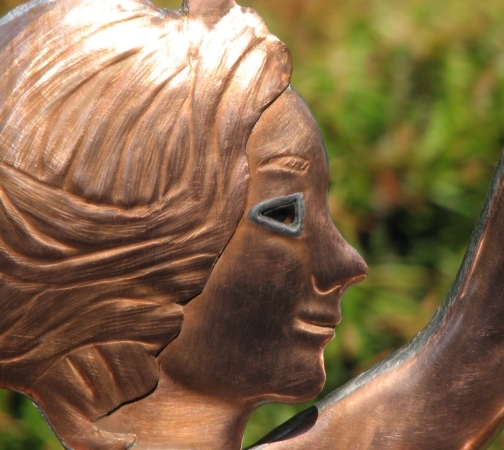 When optional gold leaf is added, you get a beautiful contrast between the darkened copper and luminous gold. The effect is quite spectacular. 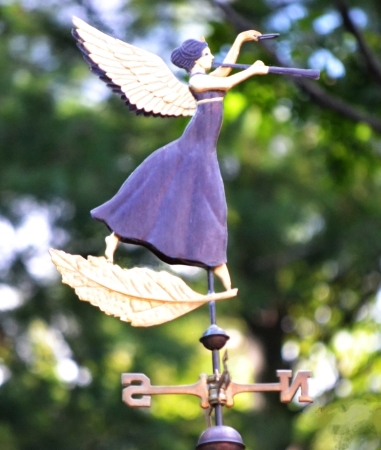 All of our human figure style weathervanes come with a choice of translucent glass jewels eyes. There are a number of colors from which you can select, although Blue, Emerald, Green and Amethyst seem to be the most popular choices. When the light is right, you can actually see her eyes shining from some distance away. The effect is quite beautiful. 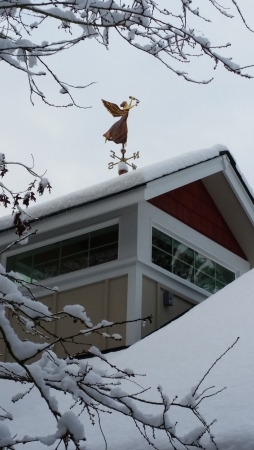 This vane was originally commissioned by customer who was inspired to use weather vanes as seasonal decoration. 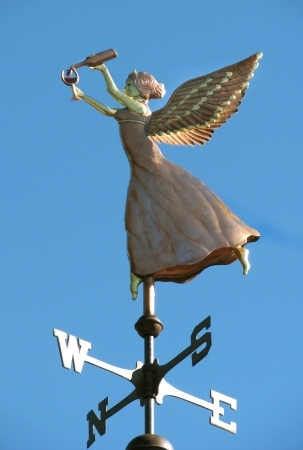 She entertains frequently on a large scale and, depending on the occasion, she switches out the weather vane she has on display. 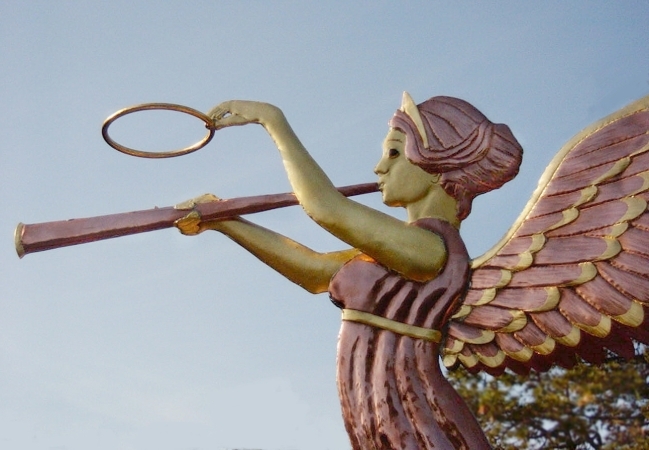 In addition to the Angel Triumphant Weathervane, she has a Witch Weathervane for Halloween and a Turkey Weathervane that she puts up at Thanksgiving. 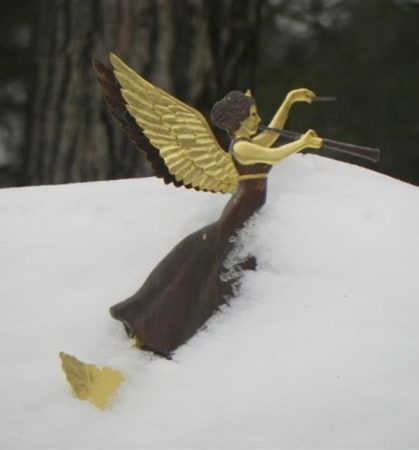 Other possibilities are an American Flag Weather Vane for the Fourth of July, a Bunny Weather Vane for Easter, a Shamrock Weather Vane for St. Patrick’s Day or a Heart Weather Vane for Valentine’s Day.